People of Jalopnik, I have sold my Hummer. Yes, that’s right: my giant, slow, loud, gas-guzzling, unreliable behemoth of a Hummer is now officially someone else’s problem. I am ecstatic, as is the Southeastern Pennsylvania office of the Environmental Protection Agency. You’d know all about my Hummer sale if you followed me on Twitter, because I posted a picture of it sitting a car transporter with a third-generation Camaro. This is odd because the transporter was heading towards New England, where both the Camaro and Hummer are banned, along with the kind of people who would want to own either of them. The only things they allow, up in New England, are E-Class station wagons and labradoodles. But before we completely expel the Hummer from our hearts and minds, I’ve decided to post one last column summing up my experience after a year of owning a giant hulking military vehicle painted to resemble a banana. I’ve also created a video for your viewing pleasure, unless of course you work in one of those iron-fisted offices where your boss actually expects you to do work all day. I wondered the same thing before I got it. In fact, I spent years wondering what it would be like to own a Hummer, and drive a Hummer, and experience a Hummer, and now, after I’ve owned one for a year, I instead wonder why anyone would want to own a Hummer, and drive a Hummer, and experience a Hummer. The main concern, obviously, is size. The Hummer is so enormously wide that driving it in a city is a tiresome challenge, where you’re constantly on heightened alert that you may, at any point, run over a gaggle of schoolchildren over on the passenger side, which is in the next telephone area code. Of course, some might say that the Hummer shouldn’t be used in the city, but that’s exactly where I see the majority of them: driving through Miami, or L.A., with the driver constantly glancing around to see if anyone is noticing. In the past, I used to glance back in admiration of the guy who was driving the coolest, most capable truck on the road. Now, when I see a Hummer, I wonder why anyone would want to drive the military version of a Ryder truck. Speed is an issue, too, in the sense that the Hummer is quite slow. Actually, “quite slow” doesn’t begin to describe it. Very slow. Hugely slow. So slow that Lance Armstrong could probably outrun it on his bicycle, even if his drug of choice was marijuana. To quantify this into actual numerical terms, the Hummer ran a 21.6-second quarter mile at the drag strip, which is slower than any new car I can think of. And it’s even slower over long distances: because the Hummer tops out around 60 miles per hour, driving it to Manhattan – usually a 90-minute trip – turned into a two-and-a-half hour endeavor, wherein I was passed by cars, vans, buses, trucks, cyclists, joggers, walkers, excited sloths, etc. And it’s loud. My God, is it loud. It isn’t as loud as, say, a modified Harley, but it’s louder than, say, every single other production automobile I’ve ever driven. Driver: DID YOU SEE THE ROYALS GAME? Passenger: THE ROYAL SHAME? DO YOU MEAN PRINCE CHARLES? Driver: PRINCE CHARLES? DO YOU MEAN CHARLES BARKLEY? Passenger: BARKLEY? DO YOU MEAN ALBEN BARKLEY, AMERICA’s 35TH VICE PRESIDENT? Driver: VICE PRESIDENT? JOE BIDEN? THE GUY FROM DELAWARE? Passenger: SELL A HARE? WHY, I DON’T HAVE ANY HARES TO SELL! ONLY HAMSTERS! It goes on like this until you reach a turn, at which point you discover the Hummer’s other major driving issue: handling. Although the Hummer is surprisingly devoid of body roll, it suffers from slow steering and a general uncertainty about where all portions of it are located during every aspect of a turn. I especially discovered when I brought it to the racetrack, where I hit approximately 4 to 7 percent of all passenger-side rumble strips, and roughly 80 percent of all passenger-side track greenery. The only part of the driving experience that came as a positive surprise was the reactions from other people. What I expected was, everywhere I went, people would give me the finger, and slash my tires, and burn my family, and spit on my corpse for daring to drive a vehicle that guzzles as much gas as the Hummer. But that wasn’t my experience. Instead, people were always eager to see the Hummer, and check out the Hummer, and look at the Hummer a little closer. I got waves, I got excitement, I got thumbs-ups, and I got smiles from practically every single person who noticed the Hummer on the street. In fact, during my year of ownership, there were only two exceptions. One was a girl I passed on a bicycle over by the University of Pennsylvania, which is this “academic institution” where they teach classes with names like Introduction to Bernie Sanders and Communism Didn’t Fail, It’s Just Sleeping. As I drove by, she screamed out “EWWWWWWW!! 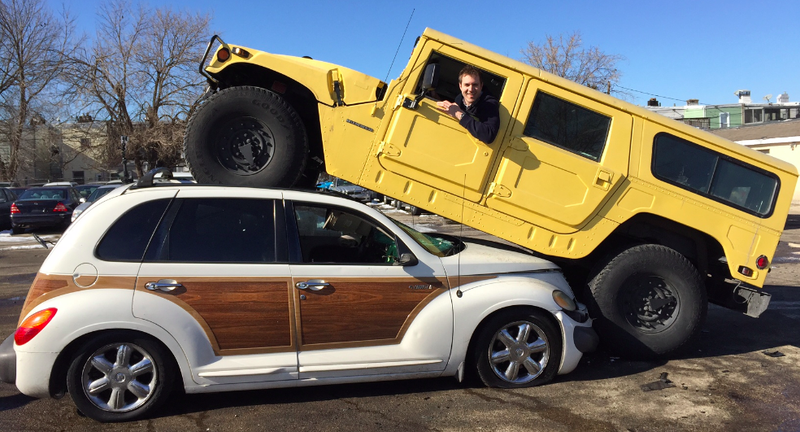 !” in an attempt to shame me and my giant yellow Hummer. Naturally, I burst out laughing. And then, of course, there was the famous note I got from one of my neighbors, wherein he called the Hummer “an eyesore to the neighborhood,” apparently forgetting that there was some guy in the next block who had an abandoned Dodge Dart parked in a vacant lot that was otherwise full of weathered patio furniture. The other thing I learned this year is that a Hummer is wildly expensive to own. For one thing, it’s expensive to buy. I bought my Hummer for around $30,000, and sold it a year later for a few thousand dollars less. This is absolutely insane to me, because my Hummer was a weathered, twice-repainted, 71,000-mile, ungainly, 20-year-old truck with an overmatched Chevrolet engine, no stereo, no air conditioning, and an interior that looks like the kind of thing that Wal-Mart would reject for quality purposes. And yet, this is what they sell for. And some cost way more: get a newer model with a bigger engine and some desirable upgrades, and you can easily find yourself paying $60,000, or $70,000, or even $100,000, just to yell at your passengers as excited sloths amble past you on the highway. It’s also expensive to own. In order to make my Hummer ownership experience as painless as I could, I chose the most reliable Hummer possible: an older model with a gas-powered Chevy V8 engine. That way, I wouldn’t have to deal with any potential electronics issues in newer Hummers – and I also avoided the famous “number eight cylinder” casting problem that eventually necessitates a complete engine replacement for every diesel-powered Hummer built between 1996 and 2000. And yet, my Hummer was still tremendously expensive to keep running. I carried out several serious repairs when I got it; a laundry list of items recommended by the dealership in order to keep my Hummer reliable during my ownership period. But a few months later, there I was, stranded on a crowded Philadelphia street during a busy Sunday afternoon in the summer. Simply put, the Hummer isn’t just “any old truck.” Despite its rather basic appearance and its “need to be able to fix it with a toothpick while we’re taking enemy fire” combat usage, the thing has a lot of unique parts and a lot of complicated issues – and it requires a skilled mechanic to understand and diagnose some of its typical faults and problems. As a result, I wouldn’t recommend buying a Hummer unless a) you want to tackle all the work yourself, or b) you can pay someone else to do all the work, or c) you want to further your career as one of the most slightly respected automotive bloggers on the Internet. And this brings me to the final question: was it worth it? Was it worth owning a huge, old, expensive, loud, slow, gas-guzzling, banana-colored Hummer for a year, just to give all of you a few laughs? To me, the answer is unequivocally yes. In fact, I think the Hummer might be my favorite vehicle I’ve owned so far for the sole purpose of writing about it and filming with it. Don’t get me wrong: I love my Skyline, and I enjoyed the experience of owning last year’s Ferrari and my Cadillac CTS-V Wagon in 2013. But the Hummer allowed me and my friends to participate in a litany of ridiculous and absurd stunts, including running over a Chrysler PT Cruiser, driving on a race track, taking a Hummer tour of Manhattan, getting a purchase offer from CarMax, going off-roading, racing at the drag strip, and hypermiling. I even let a few of my friends take it for a spin. In fact, despite the many negative qualities associated with my Hummer, I can’t think of a single time when I brought the Hummer home after filming a video where I wasn’t grinning from ear to ear. And so, Hummer, I’ll miss all the fun adventures we had. I just won’t miss driving to and from those adventures.